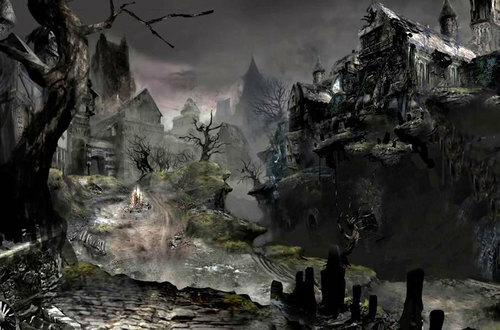 The dangling corpses and cages full of bones suggest this area is about more than just the local populace going hollow. Morticians made a living burying corpses, and wore simple worker's clothes for the dissection and burial of undead, though the ceremonial significance of such work is long forgotten. Charcoal Pine Resin was used in the Undead Settlement to preserve Undead bodies after dissection. There is no shortage of brash thieves in Lothric, and the ones imprisoned on the High Wall likely scaled the wall from the Undead Settlement. They are only willing to practice their thievery on the Wall though, for they fear the castle, which is rumored to devour men. The evangelists sent from the cathedral were teachers, all women, who came to enlighten inhabitants of the Undead Settlement and sent carriers on the path of sacrifice. Worn by inhabitants of the Undead Settlement. Official attire for the dissection and burial of undead. Naturally, the ceremonial significance of such work is long forgotten. Key to the barred door leading from the sewer below the Undead Settlement to a moist grave. The grave, which no longer receive visitors, was once the site of a statue of Velka, Goddess of Sin, and was believed to pardon wrongdoing and life curses. and these particular thieves likely scaled the wall from the Undead Settlement. keeps them clear of its grounds. Temporarily applies fire to right-hand weapon. Used in the Undead Settlement to preserve Undead bodies after dissection, and to bury them. Charcoal pine resin rotted with human body fluids. Temporarily applies dark to right-hand weapon. Normally used in the Undead Settlement for preservation and burials, but can mature into this state, becoming a valuable substance, used in a certain ceremony. Often seen for trade at exorbitant prices. Of an evangelist sent from the cathedral. These teachers, all women, came to enlighten inhabitants of the Undead Settlement and sent carriers on the path of sacrifice. So judging from the fact that evangelists were sent to Undead Settlement to " enlighten inhabitants of the Undead Settlement and sent carriers on the path of sacrifice", wouldn't it mean that the sacrifices might've been volunteer? While that is possible, I would like to present a counterpoint. I believe the carriers, the big guys with cages on their backs, are separate from the inhabitants, who were actually imprisoned. The term "enlighten" may be used sarcastically, like they didn't have a choice but to go along with it and be sacrificed.